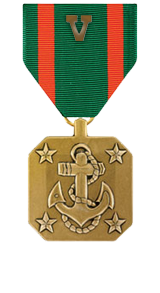 Heroic achievement in connection with combat operations against the enemy while serving as fire team leader, 2d Platoon, Company I, 3d Battalion, 3d Marines, Combined Joint Task Force-76 on 24 December 2004 and 12 March 2005 in support of OPERATION ENDURING FREEDOM. On 24 December 2004, during an ambush in the Korangal Valley, Afghanistan, Corporal Rogers displayed great courage under fire as he effectively suppressed the enemy until the platoon was in position to maneuver. While moving against the locations to which the Al Qaeda forces had fled, Corporal Rogers selflessly volunteered to assist with the search of the compounds that harbored the enemy. His actions ultimately led to the capture of several enemy combatants. Later, on 12 March 2005, during operations in the village of Salar Ban, approximately 15 Al Qaeda fighters attacked Corporal Rogers and his fire team. Pinned down by heavy enemy fire, Corporal Rogers remained calm and confident as he called in fire missions that ultimately repelled the enemy assault and protected his team. By his enthusiasm, professionalism and unwavering devotion to duty, Corporal Rogers reflected great credit upon himself and upheld the highest traditions of the Marine Corps and the United States Naval Service.